Long Dress. Our entire product range is light weight and adorns the looks of the wearer. These tunic top dres manufactured using high grade and fine quality fabric, the range is tested on various quality parameters . Tops and latest kurtis for girls to wear in official meetings, casual and other day wear events. Designer has used different techniques to garnish the kurtis like crafts designs. Ladies indian casual party wear long dress to our valuable customers. Designed in compliance with the prevailing fashion trends, these dresses are known for their trendy design and fine finish. They are comfortable for wear to college, office or any other formal or festive occasion thus, breaking the confinement to which they were previously centered. Matching jeans, churidars, leggings and trousers does the best job of eliciting a look of beauty on the wearer. Upgrade your wardrobe effortlessly with this elegant two layered georgette kurta from Nikhaar. This dress in a white shade with blue highlights has a round slightly collared neck, full sleeves, soft prints all over the kurta and a striking blue border along the hem. Team this piece with white leggings and heeled sandals for that trendy look. Designer Kurtis Nikhaar brings to you a collection of comfortable cotton kurtas that add style to your personality. This self-design kurta in a magenta shade has a collared neck, tiny buttons in the front, three quarter sleeves with a roll-up pattern and a beautiful design along the hem in the front. The elastic stretch at the back provides a comfortable fit. Team this with a pair of white leggings, heeled sandals, simple jewellery and look like a diva. 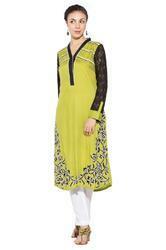 You will definitely grab lots of attention with this lime green cotton kurta from Nikhaar. It has a rounded V shaped neckline with full sleeves and a beautiful design at the sides that extends to the bottom along the hem. Team this up with white leggings, heeled sandals and matching earrings to complete the look.